Say it with words. 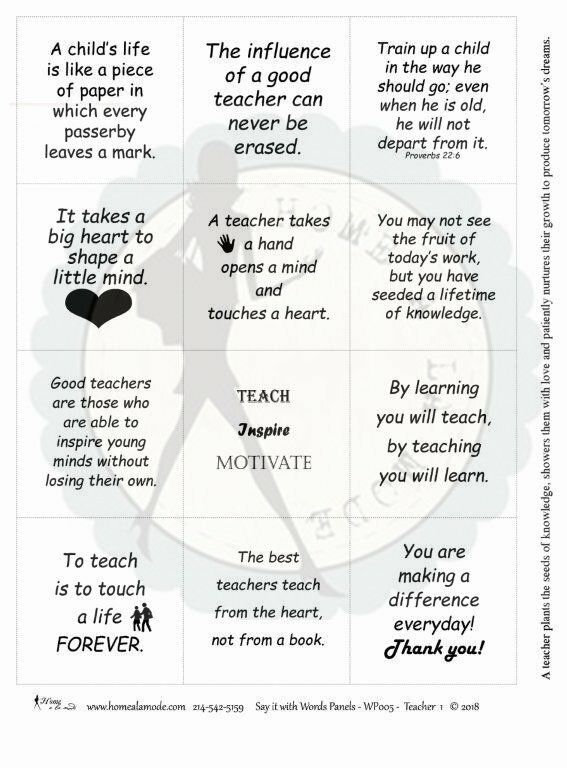 TEACHERS is a Home a la mode word panel that is all about the serious side of our feelings and the fun learned rules from our TEACHERS... like: A child's life is like a piece of paper in which every passerby leaves a mark. - The influence of a good teacher can never be erased. - Train up a child in the way he should go; even when he is old, he will not depart from it. Proverbs 22:6 - It takes a big heart to shape a little mind. - A teacher takes a hand opens a mind and touches a heart. - You may not see the fruit of today's work, but you have seeded a lifetime of knowledge. - Good teachers are those who are able to inspire young minds without losing their own. - TEACH, Inspire, MOTiVATE - By learning you will teach, by teaching you will learn. - To teach is to touch a life FOREVER. - The best teachers teach from the heart, not from a book. - You are making a difference everyday! Thank you! - A teacher plants the seeds of knowledge, showers them with love and patiently nurtures their growth to produce tomorrow's dreams.